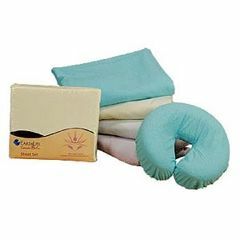 Earthlite's Samadhi Pro massage sheets are the ultimate in massage sheets and table linens. Samadhi is Sanskrit for "state of bliss," which is exactly what your clients will experience when they lay on these premium sheets. Each massage sheet is made of pre-shrunk cotton flannel, are double-napped for an extra level of soft, luxurious comfort and are engineered to withstand repeated washings. The fitted massage sheet is hemmed with elastic all the way around for a snug, comfortable fit and will fit tables up to 33" wide. Also available in Lavender sheet.